Relaxed modern open plan home. Entertainers kitchen. Parquet dining table seats 8+. 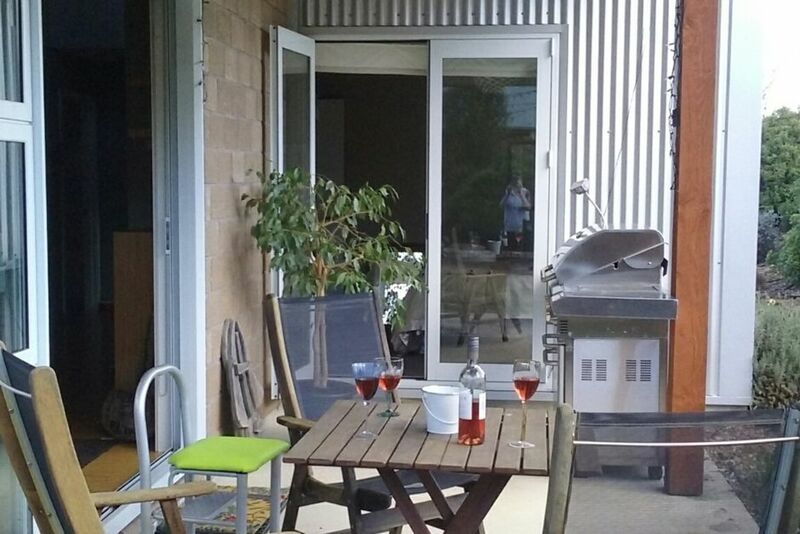 Sliding doors open to the outdoor barbecue and seating area. This home is close to the Lake Hawea amenities but is part of a quiet community based street. Library, parks, lake, cafe, local store and pub are all within a ten minute walk. The Wanaka and Hawea winters are known for their crisp nights and sunny days, and large windows allow ample sun in the house. Dress up warmly and get out and enjoy all that this area has to offer. This is a holiday home where you can come and enjoy yourselves, and unwind from the stresses of work and a busy life. Easy access to the great outdoor options that this area is so well known for: the boat ramp, fishing spots, golf course, mountain bike, walking and running tracks and lake beaches are all only a few minutes away. Cardrona and Treble Cone ski fields are close by. Wanaka with its range of interesting activities and options is just a fifteen minute drive away: cafes, restaurants, shopping, medical centres, movie theatres, golf course, Puzzling World, and the famous Waste Busters. Still probably closer than these options for you at home - but they feel like a world away as you relax and appreciate the true beauty of Central Otago in friendly Hawea. For wine lovers there are a number of vineyards within the area, and two breweries for lovers of craft beer. Don't overlook the Warbirds and Wheels Museum or the Transport and Toy Museum; they are not just for the kids! Fly a plane, jump from a plane, walk Mt Iron, swim in the Blue Pools, mountain bike Deans Bank, photograph #thatwanakatree - NZ's most photographed tree! There is something for everyone in this area! Pets allowed with prior approval. Bond may be required. Best suited to small families or two couples. May be suitable for wheelchairs or those with limited mobility. Not suitable for party groups. Basic linen provided but please supply own beach towels. Please leave the property tidy. Generally 5 night minimum, but fewer night stay may be considered on occasion. Feel free to ask. Really excellent place to stay. Really excellent place to stay. V comfortable and very close to everything in Hawea. Will definitely stay again. We had a wonderful stay here. Being Binsey's own home, the house is lovely. It was very comfortable and had everything we needed.